This re-post is a great reminder of what girls – and Guiders! – can achieve on a moonlit winter’s night. Three years ago at my first monthly District Guider meeting, one of our (amazing!) 50+ year Guiders advised our group that the district had a huge cache of snowshoes at our disposal. It was my first year as a Guider and I was seriously intimidated at the thought of organizing snowshoeing for my Sparks – it was never going to happen. 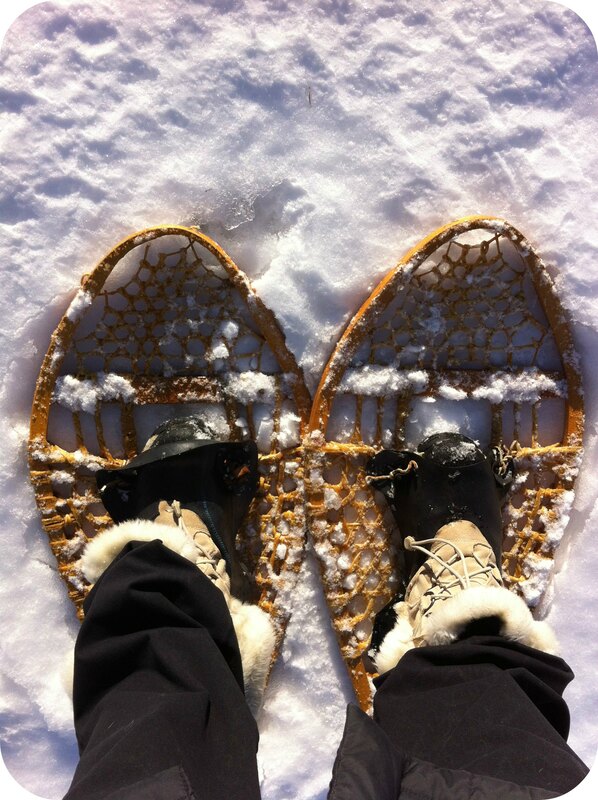 Fast forward to two weeks ago… Alberta has been hammered with snow this year and out of the clear blue (okay snowy and overcast) sky it hit me – I’M TAKING MY GIRLS SNOWSHOEING! I finally felt confident enough in my Guiding skills to take my 21 girls out for some winter fun. And hot chocolate. Sparks MUST have hot chocolate. It came together very quickly. We were at the beginning of a huge Chinook and I only had a few days to plan. I live on an acreage near our city so location was a no-brainer: my garage and yard. I advised all my parents via email on the Sunday before our Wednesday meeting with a map and a “what to wear” list attached. I had a huge positive response from my parents and had a full compliment of volunteers to help us that night. Wednesday afternoon I cleaned out the garage, put together some makeshift benches, picked up some hot chocolate, and gathered the snowshoes from storage. I spent an hour with my own two kids making a track for my Sparks to follow through the yard, weaving through trees and over hedges. The drifts were up to five feet tall! The girls arrived and after a quick rundown of rules and instruction, we were into our shoes and off! It was a full moon that night, the wind was calm and the temperature was only about 0°C. We had 24 kids (including Girl Assistants) in a train, wearing glow stick rings, snowshoeing through my yard by the light of the moon. By guest blogger Jodi Paulgaard, a Guider in Airdrie, Alberta. This entry was posted in Camping & Outdoors and tagged challenge, outdoor activities, sparks, winter camping, winter fun. Bookmark the permalink. 2 Responses to Sparks CAN Snowshoe! A sleepover is a great decision… go for it! I used to be a Guide in Alberta and we went on a winter camp and go to Showshoe it was great fun, it was almost 20 years ago and I still remember it like it was yesterday!